My usual gut response to hot new artists is to run screaming, but I have to say: I could listen for a long time, on repeat loop, to Amy Winehouse's Back in Black, Rehab, and You Know I'm No Good. Music for people who can't wait for summer to start blazing down. Yeah, she'll make you want to drink...you needed the excuse? Strange week. I apologize for the many emails I have not yet sent. The literary world is atwitter with news of fellowships, M(F)A program admissions, colony stints, book deals. I'm truly thrilled for Dan Albergotti, who just won BOA's Poulin prize--a genuine case of hard work and awesome poetry paying off after a long wait. But if you're not one of the many who's receiving news this week...join me! We shall develop a secret handshake. staring in wonder as the serpent twitches in small throes. the moment her beauty first made Orpheus sing? Update - While I'm in the business of announcing things, I can finally say that Deborah Ager (publisher of 32 Poems and its attendant blog) just had her first book, Midnight Voices, accepted for publication by Word Tech's Cherry Grove imprint. Hooray! The last two days have been a whirlwind: bringing Sally Mann, the famed Virginia photographer, into town for a "Ladies Luncheon" conversation about her life and work. Our event coincided with the Corcoran Gallery screening of a new documentary, "What Remains," directed by Steve Cantor. Cantor was given unlimited access to the Mann family, accumulating over 400 *hours* of footage, and the result is an illuminating film. What a force of nature this woman is--a woman who knows the value of her time, and isn't afraid to let you know it. Meeting her left me both charmed and immensely respectful. One resonant observation she made, during an interview with the curator Philip Brookman, was how her "Deep South" landscape series is predicted within the evolution of her preceding work. To paraphrase, looking at the photographs of her children (the "controversial" Immediate Family series, which went on for about 10 years), in later shots the children began to recede from the foreground, further and further back in each finished frame. Eventually they existed less as distinct charaters and more as shadows, silhouettes, counterpoints to a larger scene. And it was then that Sally realized her focus, as a photographer, had shifted to place rather than person. I'd be curious to find an equivalent in poetry. Did you ever have what started as a minor motif come to loom larger and larger in a poetic series, until you realized you'd committed to a whole new subject? As someone shopping around a manuscript, I grow picky about production values. There's a lot of admirable in spirit, no-budget presses out producing books that, to be honest, look cheap. Dull paper stock, blurry text as if it were mimeographed. I know that there is an aesthetic of ephemerality at work, but I don't want that for my book. That said, you can't buy taste: there's a lot of well-funded university presses with absolutely clunky design. Covers on which the title is squeezed into a little bit of a painting's "free" space. Times New Roman font. For "impact," garish primary colors that will look outdated in five years. Ew. Argh. But below are exemplars and links to four small, independent presses whose wares I got to examine at AWP--feel, flip the pages, heft in the hand. I was truly impressed not only on an editorial level, but with the book as object. If you're on the fence about these presses because you've never seen their books, take this as my stamp of approval. Black Ocean Press - The design of these books gets better and better with each volume. The Man Suit, by Zachary Schomburg, is an absolutely great little book with a macabre yet playful graphic style that reminds me of Edward Gorey. One poem features small black and white icons of telephones. Schomburg's book was the only one that I bought at AWP on the sheer strength of an author's reading...Black Ocean poets will go on to do big things. They've also got Small Press Distribution, a major plus nowadays. Doesn't accept unsolicited manuscripts, for now. Switchback Books - At right is Switchback's first book, Talk Shows by Monica de la Torre. I was won over by the energy the editors projected in Atlanta, and the phenomenal offsite reading they organized (which included a talented, larger community of Chicago poets, such as Kristy Odelius, that I hope might soon turn up in their catalogue). You can't form a binding opinion based on one book, but they made smart choices with a nice, lightweight paper and low gloss on the cover stock (too much and the embedded text pattern would have been lost). Extra points for having the guts to make orange & green signature colors. Red Morning Press - RMP is only just beginning to make itself known. They don't have widespread bookstore placement or distribution, and even within DC the editors are slightly outside the "literary" loop. But they are making up quickly for lost time, picking good poets and taking a conspicuously professional approach (all three founding editors have succeeded in other areas of business). Their "Our Mission" and "About Us" sections are refreshingly direct, and their refusal to charge reading fees is admirable. Bonus: they consider unsolicited manuscripts by email. Ghost Road Press - Good God, their covers are *gorgeous*. I don't know much about these guys--they're based in Colorado, so I'm hoping I learn more when AWP is in Denver a few years from now. They did some interesting cross-media promotionals with Jeffrey Ethan Lee's Identity Papers. They are considering manuscripts through July (send a 10 pg sample). One quibble: why not have sample poems on the website? But I do like their print catalogue, downloadable in PDF format. A special prize goes to Ahsahta, even though it has a university affiliation (Boise State). Those volumes luxuriously constructed, vellum fly pages and all...okay. What are your favorites? Tinysides are now for sale over at Big Game Books...a limited edition of one of my poems costs $1. Just one dollar! C'mon, your latte costs more than that. This time around, it's not "Who am I?" but "Who are you?" Lauren Bender starts us off, telling "you" exactly where you aren't. Logan Ryan Smith then experiences the self as other -- "all 5 senses served up on the gutter," slinking around the depths, "little gums ringed with blood." Keeping up our sojourn in the animal kingdom, Adam Golaski brings us altered syntax as well as an altered form -- that of the fox darting down the highway, cubs not long behind. Joanna Fuhrman then brings us to a place where "no one looks the same though everyone is," a world that procedurally mimics the normal conventions, but skews the substance into a dreamy, hectic refraction. 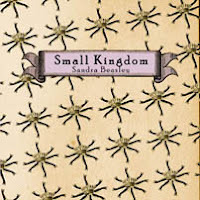 Finally, Sandra Beasley contemplates the intimate problem of the other, and how to integrate it with the self's "small kingdom," where law and order kind of hate to give way. As always, a buck a pop, $4.50 for the whole set. First, I'd be remiss in not linking to this superb mini-essay on AWP from Patricia Smith, part of the Poetry Foundation's new "Harriet" blog. There's a lot of work to be done on the ways the Foundation is spending its money, but I do like these entries from Smith, Kwame Dawes, and others. Worth a look. Best panel: "Inventors in the Temple: Avant-Garde Formalism," with Catherine Daly, Timothy Donnelly, Annie Finch, Brian Johnson, and Ravi Shankar. I'm not a practitioner of Oulipo; to be honest, I don't even like most of the Oulipo works I've read. I went into this panel simply wanting to feel more comfortable with the style, even if it was for the purpose of using a more accurate language to express my criticisms. The panel started off on a difficult note, comments rife with jargon--it reminded me of college debate, where someone would try to assert control over a topic using an elaborate "setting of terms"--but it improved steadily from there. I loved one panelist's passionate defense that there is nothing wrong with letting language be dictated by a love of sound, reaching back to childhood enthusiasms for "Peter Piper Picked a Peck of Pickled Peppers." Annie Finch made a focused and convincing effort at reconciling "Avant Garde" formalism with historical formalism, for contrast pointing out that while both of these modes use restraints and constructs with a sincere desire to occupy the form, "New" or "Neo" formalism invokes forms for the express purpose of breaking or resisting them. She used the exemplar of two villanelles by the same author: one which allowed the formal repetition to fracture language in an expressive way (the "Avant Garde" variation), one which offered more traditional syntactic AND emotional closure, but only because the author had bent the rules of the form (a nod at New Formalism). She tripped herself up a little bit in later discussion of these poems (it might have been better if she'd used two different authors, to create a clearer comparison). But there's the kernel of a really useful idea here, something that could be used to bring "radical" formalism (her preferred term to "Avant Garde") to a wider audience. Personally, I walked away much more open to giving those poems a chance. Best behind-the-scenes: The night before, riding up in the same elevator as Annie, who clutched a book and moaned to her friends "WHAT am I going to say about these poems?" Best reading: The Greensboro Review 40th Anniversary Reading. When things kick off with Natasha Trethewey, you know you're in good hands. Usually fiction is a lull in a long reading, but Kevin Wilson had a hilarious short story about "The Screaming Baby." Patrick Phillips was also extraordinary--I honestly think he''ll be recognized as a master of metaphor amidst the next generation of poets. Moment of strangeness: Realizing that Carly, my fellow DC poet and amazing AWP roommate, is a total product diva! Our bathroom was swimming in gels and lotions, and she even had one of those little silky face masks for sleeping. This was actually a wonderful thing, because it meant that I had a partner in crime for ordering breakfast room service. Moment of internal grin: Running into Cornelius Eady and Greg Orr at the same time, in the Hilton lobby. Throwing my arms around Cornelius. Hearing Greg say "See, you got the first hug." Best off-site event: The reading for Switchback Books, which included finally meeting Kristy Odelius--an amazing Chicago poet--and telling her that I had fought to publish one of her poems in a literary journal I edited a few years ago. Best authentic cuisine: A tie between the creamed corn/"pot likker" sides at Mary Mac's and the ribs at Django Cafe. Local hero: Bruce Covey, who made sure I got to Rita's reading at Emory on Wednesday night, and then drove me to the Pussipo reading. His "Flattery" poem (part of the No Tell marathon) was a highlight of the Saturday night reading at Apache Cafe; he also spoke very convincingly on behalf of Coconut at the panel on online literary journals. A few months ago I heard someone call Bruce "the nicest guy in poetry," and I think she was right. Poet I could listen to (/stare at) for hours: Terrance Hayes. He stole the show from Charles Wright. Best marketing: Those "Hello, My Name is _Michael Martone_" tags. Most overrated moment: Making it into the top floor lounge, Nikolai's Roof. Smoky, crowded, a lot of neck-craning in hopes of finding someone "important" to talk to. Drinks were free but watery--I was happy to have my flask of scotch. Finally settled at a table with Dave Lucas (UVA) and some other low-key folks, which was a relief, but hard to believe that in past years I envied the VIP party as some mecca shindig. Next year...New York. I'm proposing a panel. It is going to be crazy. And note to the organizers: make sure fresh oxygen gets pumped into the book fair room, okay?